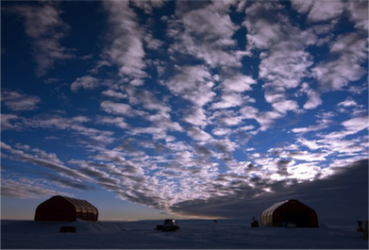 In Greenland, deep ice cores give access to high resolution archives of past precipitation spanning the last decades to glacial-interglacial variations. I have been using measurements of water stable isotopes in Greenland water vapor, surface snow, and ice cores, in order to better understand the climate information archived in the deep ice cores. Our most recent findings reveal that water stable isotopes are excellent tracers for changes in the origin of water vapour, thanks to the monitoring of an exceptional atmospheric river event which led to widespread melt at the surface of the Greenland ice sheet, in July 2012 ; that water stable isotopes reflect exchanges of water vapour between the surface snow and the surface water vapour, in-between snowfall events, challenging the classical view that ice cores reflect "precipitation weighted climate signals". I will also show recent work performed using a synthesis of all Greenland water stable isotope records spanning the past thousand years. Combined with climate simulations and with other North Atlantic paleoclimate records, these data are used to assess the recent variability of large scale modes of variability : the North Atlantic Oscillation, and the North Atlantic bidecadal sea surface temperature variability. Our results depict significant responses to explosive volcanic activity (Pinatubo-like volcanic events), with implications for multi-year climate predictability. I will finally stress the specificities of the water stable isotope - temperature relationships identified in north-west Greenland, at the NEEM deep ice core site, and their implications for reconstructions of past temperature and ice sheet topography. Indeed, the NEEM ice core provides the strongest constrain on the constribution of the Greenland ice sheet to the sea level rise of the last interglacial period (about 125 000 years ago) with strong implications for evaluating climate and ice-sheet models, in a context of multi-millenial Greenland warming It also has implications for the assessment of the stability of the Antarctic ice sheet during that period. I will therefore illustrate several aspects which are important for the long-term sea-level commitment associated with global warming and which have contributed to the IPCC AR5 assessment. Valérie Masson-Delmotte, is senior scientist at CEA, Laboratoire des Sciences du Climat et de l’Environnement (IPSL/CEA-CNRS-UVSQ). Bonne, J. L., Masson-Delmotte, V., Cattani, O., Delmotte, M., Risi, C., Sodemann, H., and Steen-Larsen, H. C. : The isotopic composition of water vapour and precipitation in ivittuut, southern greenland, Atmos. Chem. Phys., 13, 30521-30574, 10.5194/acpd-13-30521-2013, 2014. Steen-Larsen, H. C., Masson-Delmotte, V., Hirabayashi, M., Winkler, R., Satow, K., Prié, F., Bayou, N., Brun, E., Cuffey, K. M., Dahl-Jensen, D., Dumont, M., Guillevic, M., Kipfstuhl, J., Landais, A., Popp, T., Risi, C., Steffen, K., Stenni, B., and Sveinbjörnsdottír, A. : What controls the isotopic composition of greenland surface snow ?, Clim. Past, 10, 377-392, 10.5194/cp-10-377-2014, 2014. Masson-Delmotte, V., Swingedouw, D., Landais, A., Seidenkrantz, M.-S., Gauthier, E., Bichet, V., Massa, C., Perren, B., Jomelli, V., Adalgeirsdottir, G., Christensen, J. H., Arneborg, J., Bhatt, U., Walker, D. A., Elberling, B., Gillet-Chaulet, F., Ritz, C., Gallee, H., van den Broeke, M., Fettweis, X., de Vernal, A., and Vinther, B. : Greenland climate change : From the past to the future, Wires Clim Change, 3, 427-449, 10.1002/wcc.186, 2012. NEEM : Eemian interglacial reconstructed from a greenland folded ice core, Nature, 493, 489-494, 10.1038/nature11789, 2013. Masson-Delmotte, V., M. Schulz, A. Abe-Ouchi, J. Beer, A. Ganopolski, J.F. González Rouco, E. Jansen, K. Lambeck, J. Luterbacher, T. Naish, T. Osborn, B. Otto-Bliesner, T. Quinn, R. Ramesh, M. Rojas, X. Shao and A. Timmermann, 2013 : Information from Paleoclimate Archives. In : Climate Change 2013 : The Physical Science Basis. Contribution of Working Group I to the Fifth Assessment Report of the Intergovernmental Panel on Climate Change [Stocker, T.F., D. Qin, G.-K. Plattner, M. Tignor, S.K. Allen, J. Boschung, A. Nauels, Y. Xia, V. Bex and P.M. Midgley (eds.)]. Cambridge University Press, Cambridge, United Kingdom and New York, NY, USA. Buizert, C., Gkinis, V., Severinghaus, J. P., He, F., Lecavalier, B. S., Kindler, P., Leuenberger, M., Carlson, A. E., Vinther, B., Masson-Delmotte, V., White, J. W. C., Liu, Z., Otto-Bliesner, B., and Brook, E. J. : Greenland temperature response to climate forcing during the last deglaciation, Science, 345, 1177-1180, 10.1126/science.1254961, 2014.